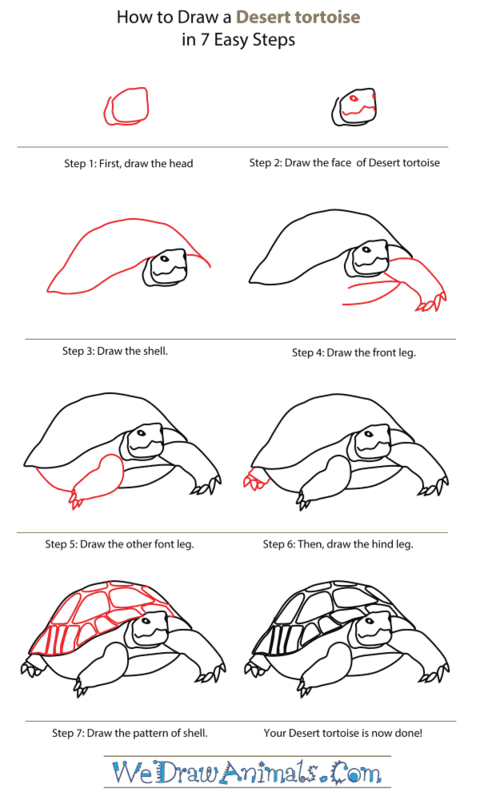 In this quick tutorial you'll learn how to draw a Desert Tortoise in 7 easy steps - great for kids and novice artists. 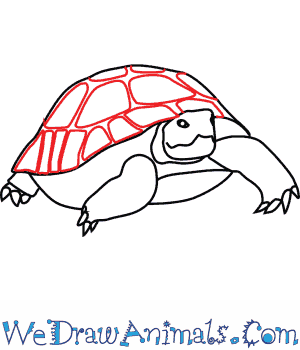 At the bottom you can read some interesting facts about the Desert Tortoise. Step 1: Draw the head by using a very rough and uneven square and then adding another rough line that runs along its bottom and left sides. Step 2: For the eyes, use a small oval with a dot in it for one eye and a dot on the edge of the right side of the head for the other. 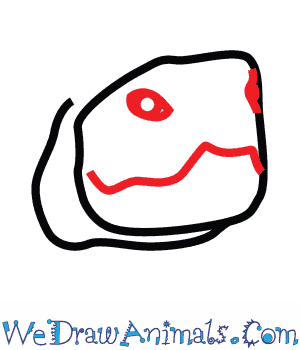 Draw a jagged line across the head for the mouth. 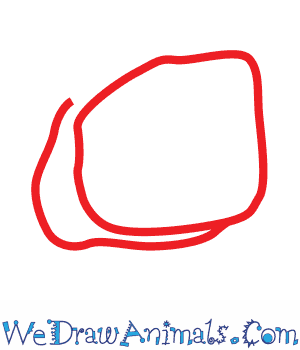 Step 3: Draw the shell by making two bumpy lines, one near the head and less curves and one over that with a larger curve. Step 4: Draw the front leg by making two curved lines that end at four pointed and uneven toes. 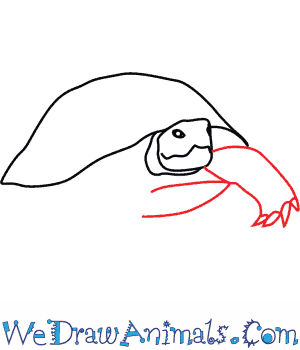 Then draw two lines from the arm to make part of the lower shell. Step 5: Make another leg much like the first described, except have the toes and foot face the left along with the rest of the leg. 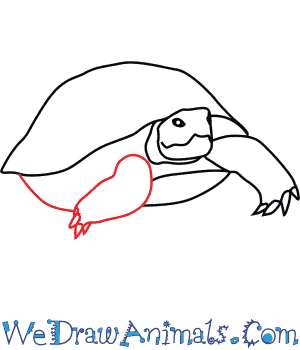 Then draw a line to connect the upper and lower shell. 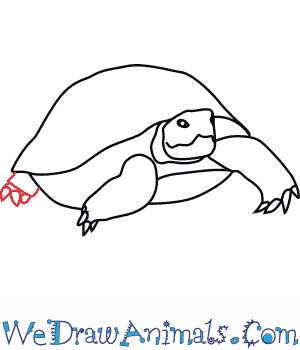 Step 6: Draw the hind leg by making a much shorter and straighter copy of the front two coming off the left part of the shell. Add three large toes to it. 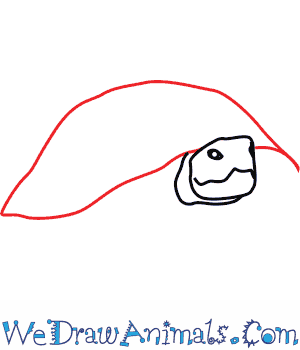 Step 7: Add the pattern of the shell as shown above in the picture. Try not to have the shapes go into one another. 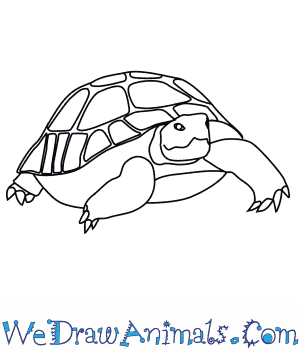 Your Desert Tortoise is now done! Desert tortoises are reptiles that inhabit Sonoran and Mojave deserts in the western United States and Mexico. The desert tortoise was divided into two species in the 2000s. They are the Morafka’s desert tortoise and the Agassiz desert tortoise. On average, desert tortoises grow to be 10 to 15 inches long, and they weigh between 8 and 15 pounds. Male desert tortoises are larger and have longer tails than females. The average lifespan of a desert tortoise is between 23 and 54 years. Desert tortoises are herbivores. Their diet includes flowers, cacti, fruits, and grasses. Desert tortoises get water from the plants that they eat. They also dig waterholes to catch rain. Desert tortoises store water in their bladder and live off that supply for months. Desert tortoises spend most of their lives in rock shelters or burrows, to keep cool and minimize water loss. Desert tortoises can survive in temperatures higher than 140 degrees Fahrenheit. The population of the desert tortoise is threatened by construction in the desert and diseases. People have been known to accidentally run over desert tortoises in their vehicles. Littering and hunting are two other reasons why the desert tortoise’s population is at risk of becoming endangered.